1287Dragonfly - 1lt Table Lamp, Antique Brass, Tif..
have always been a highlight at Lumination as we specialised in tiffany lamps and wall lights. With the experience of more than 20 years we have compiled the current range from all our best sellers over the years. 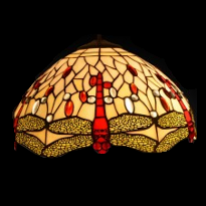 The dragonfly is undoubtedly the most popular which is why we offer 3 colour options in this iconic piece of lighting.All our tiffany lamps shades are hand made from glass and copper foil in the age old traditional method of manufacture. The only modernisation is the use of lead free solder to ensure full compliance with EU import regulations.A piece of Tiffany lighting will add stunning colour and pleasure to any room setting and will be a cherished piece for years to come.Our lamp shades are sold separately so you can mix and match the lamp base, flush fitting or pendent.